This year’s trip started with a revisit to a romantic hotel we stayed in 31 years ago. Where did the time go? In some ways it definitely feels like a different lifetime ago, but I am stumped at where all that went…so quickly! It’s still a very romantic spot, and dinner here was quite wonderful. 30 years on, I am even more appreciative of a stunning setting and excellent food. The road in front of the Sugar Mill runs along the coast and looks north to Jost Van Dyke. Last time that didn’t mean much to me, but this time we visited that island shortly after our evening here, so now I know a little about Jost Van Dyke. 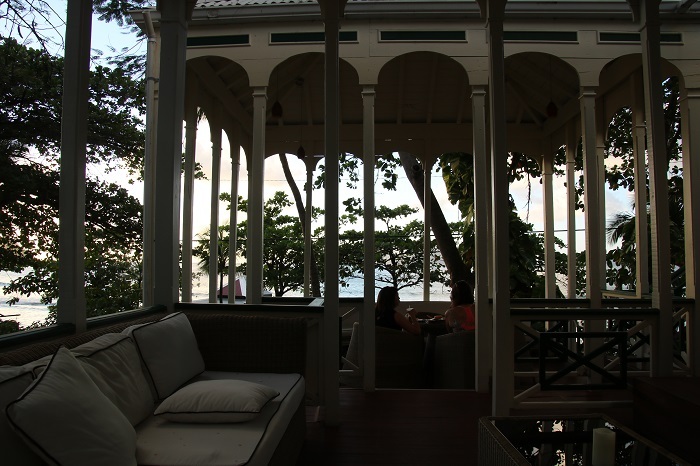 We made sure we got here in time to enjoy the sunset, which is beautiful from this lovely Victorian porch with cushioned settees for relaxing. It was very relaxing. To mark the occasion I had a Pimm’s Cup to remind me of spring evenings in England with my dear friend Lesley. 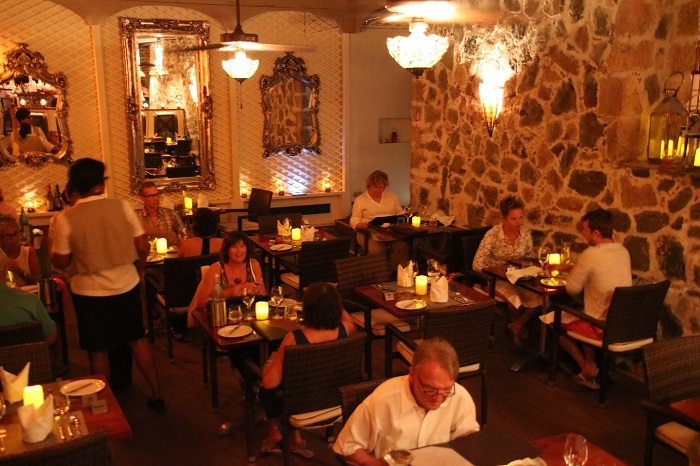 The dining room is just as I remember….the stone walls of the old mill yet open air to the ocean. That’s me at the back of the room on the right, deciding what to have for dinner! The Sugar Mill does not show up in any of the guide books we’ve got with us, which is rather baffling. 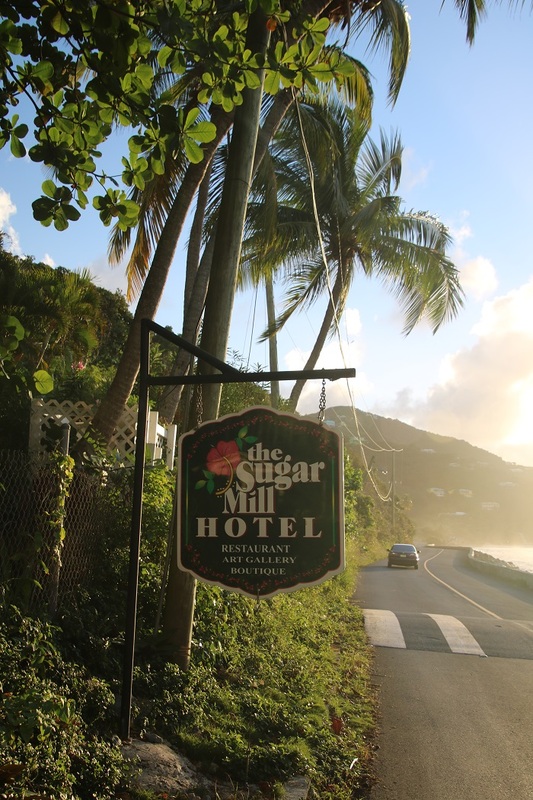 It is listed in “Romantic Inns of the World,” but that might not be the place you’d look if you were researching where to stay on Tortola. Anyway, clearly they are doing something very right. We would have loved to see the owners from 30 years ago, Jeff and Jinx Morgan, who wrote for “Gourmet Magazine” for many years. We missed them by only a year or two. I hope that they are well, wherever they are these days. We are now in St. Martin/St. Maarten which is new territory for me. The island is a range of tall volcanic mountains, some so steep that there are no roads and no inhabitants up those slopes. Part French and part Dutch, there is lots to see and do, and two rather different cultures to enjoy. Here we are at the top of one of the highest points. We drove partway up with our rental car, then walked the rest of the way. Our friend Bill took this photo which looks idyllic. You cannot tell there is a gale blowing up there, and we were afraid to go any closer to the edge for fear we’d be blown right off! Aren’t these pretty? The petals are so like an oncidium orchid that flutter in the breeze, but those long stamens are definitely NOT an orchid. 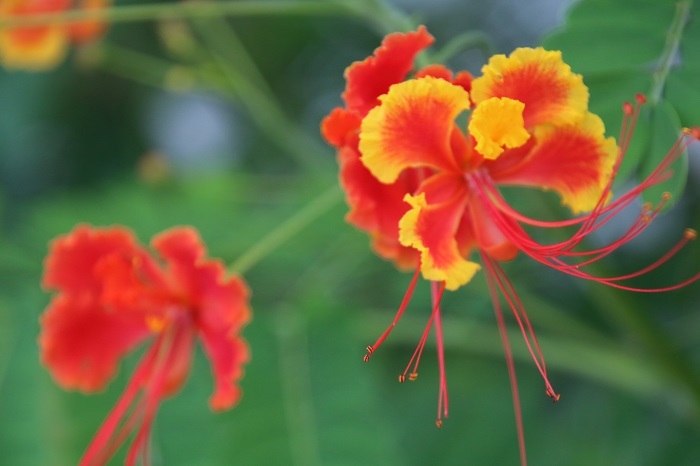 These flowers come in yellow and orange, and my favorite here, a blend of the two! They grow on a somewhat shrubby plant that has leaves similar to a maiden hair fern. I would love to have a plant onboard, even a red geranium. So far, I have not found a nursery where I can buy something green. My friends aboard other boats suggest I get over this. If I get a plant it will just be taken away when we enter a different island nation. Sad face…. Along that road to the top of the mountain were some very impressive villas, and some houses that looked like they’d been built by hands that did not know much about building a house! I think some of these diy houses were hideouts for people who no longer wished to be known. 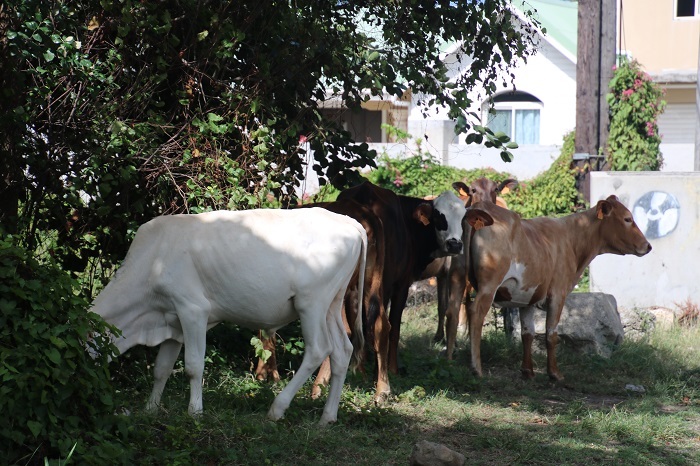 Along with wild goats and chickens that roam the roadsides, here there are also wild cows. They do not cross the road quite as quickly as goats or chickens. On our way down we stopped at a large park called Loterie Farm. 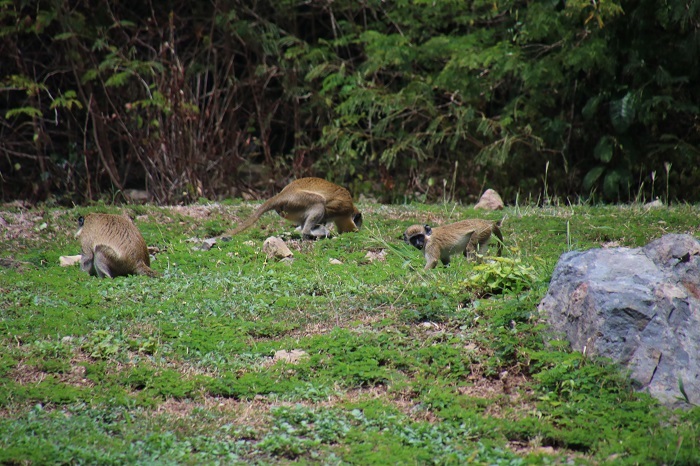 It is preserve for wild monkeys, iguanas, and had a maze of zip lines for use in getting a wonderful view of the flora and fauna from some thrilling heights. 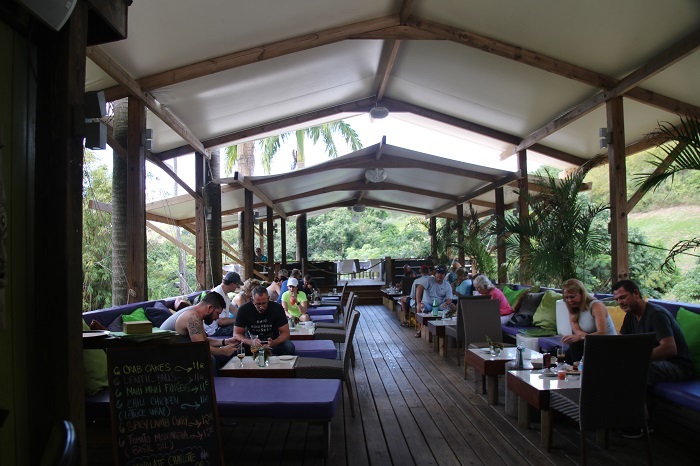 That is a bit too much of a thrill for me, but I enjoyed seeing the views from the tree house style tapas bar, where I had a tropical drink with a salad and a crab cake. Far more sedate than zip lining! 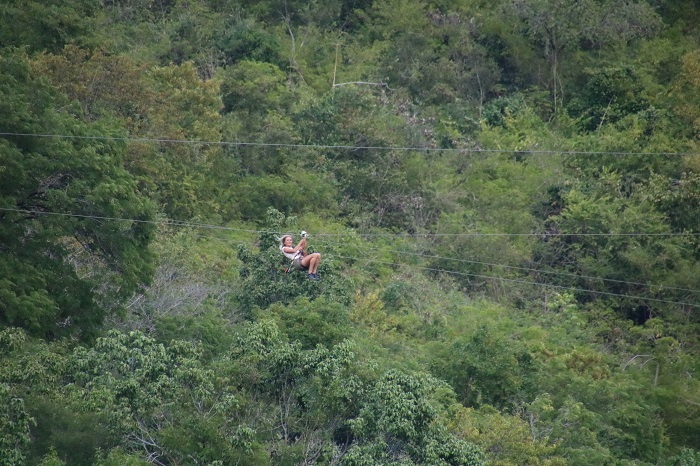 I was happy to enjoy the restaurant views, rather than experience them from the tree tops on a zip line! 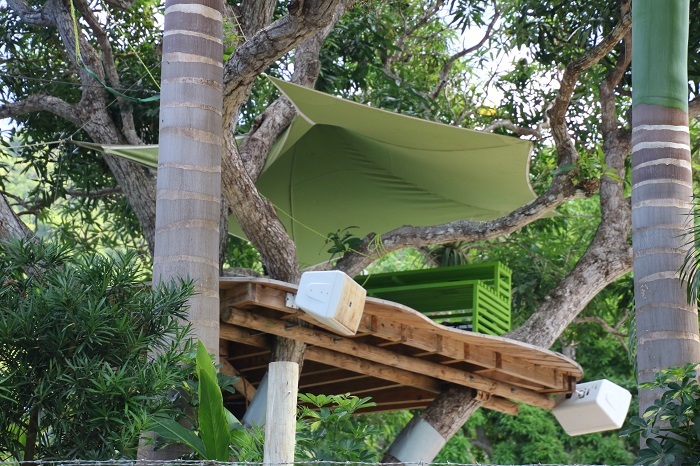 Next time it would be fun to rent this tree top cabana near the pool. We ended the day at the beach right near Princess Juliana Airport, where some of those adventurous zip lining people line up at the end of the runway to be blown off their feet whenever a jumbo jet lands or takes off. 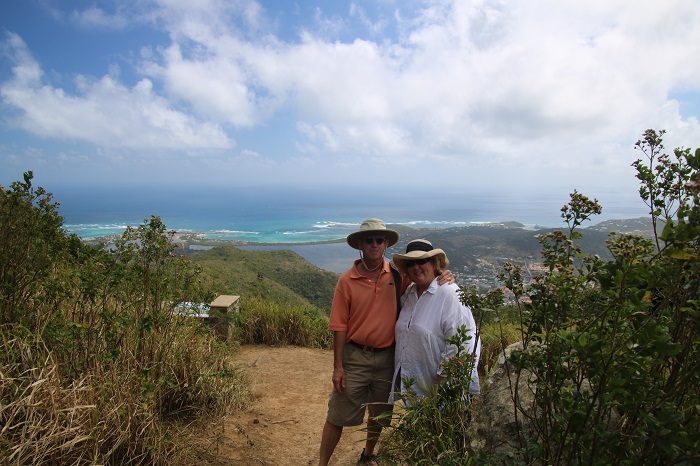 There is no end to the risk taking you can experience on St. Martin. I’m happy to watch from the safety of the nearby bar, thank you. This entry was posted in sailing, travel. Bookmark the permalink.